Users can capture, view, and export all entry information. This App offers ability to randomly select a winner or multiple winners. The App Builder page shows up in the screen after you click the Add+ button. It is composed of Sweepstakes Setup, Live Sweepstakes, Terms, Rules, Privacy, Pre-Sweepstakes, Post-Sweepstakes and Pick Winner. The first sub-section of the App Builder section is Sweepstakes Setup. 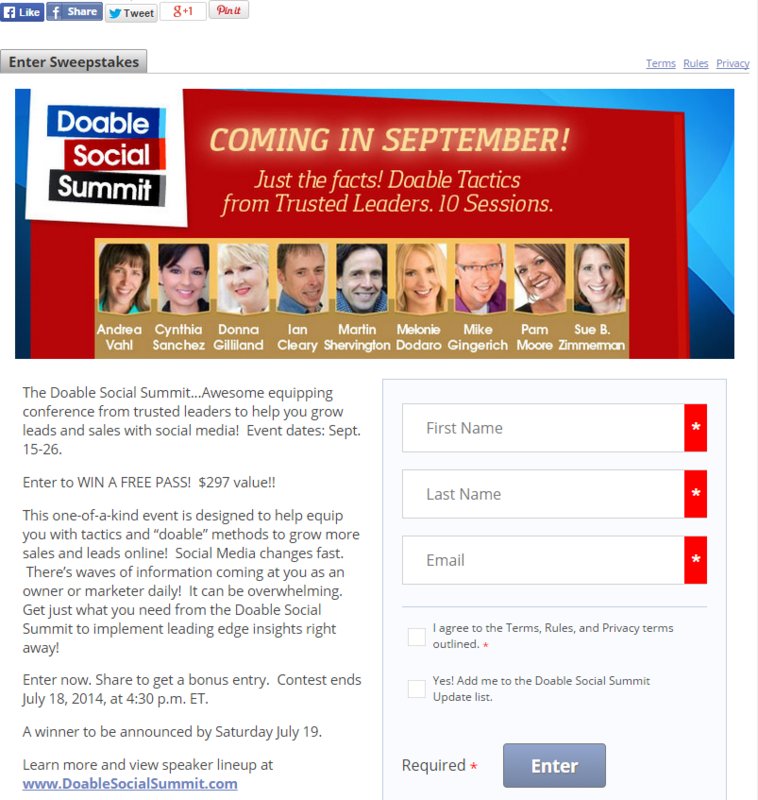 First, it requires you to enter your Sweepstakes name for the draw. Then, set the starting date of the draw, starting time, end date, end time and your time zone. It has additional options below namely “E-mail submissions to” and “Enable email”. The former allows you to have submissions emailed to multiple parties. To do this, just add a comma between these email addresses. Meanwhile, the latter enables you to receive an email of each submitted entry. This is helpful in cases where thousands of entries will come in. Single App Plan users and above will always have access to all entrant information via the Exporter link on the left in the TabSite Manager. The second sub-section is the Live Sweepstakes. It is composed of three sub-sections specifically Form Options, Thank You Message and Optional Form Response. It enables you to setup your main sweepstakes message and form. This is where you draft your sweepstakes details and requirements to entrants. 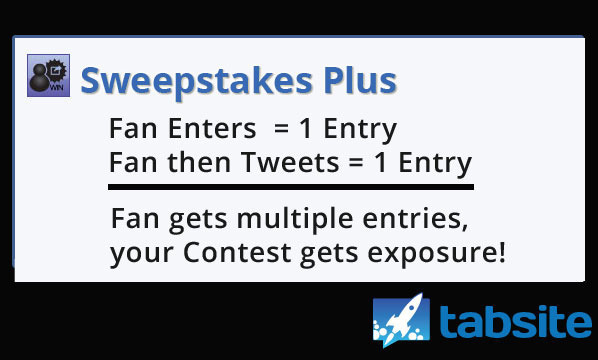 Use an image, text, or both to outline basic sweepstakes information. 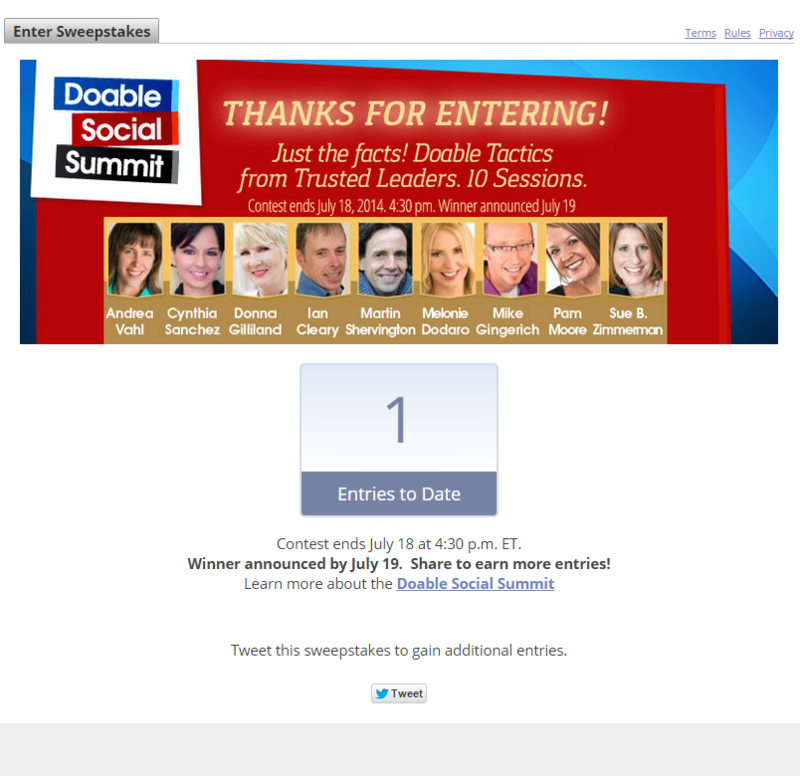 Note that depending on your image or text content, the size of your entry form, and other variables, some layouts may not work well; make sure to preview you sweepstakes before publishing. 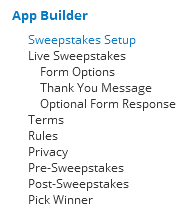 The Form Options is the first sub-section under Live Sweepstakes. 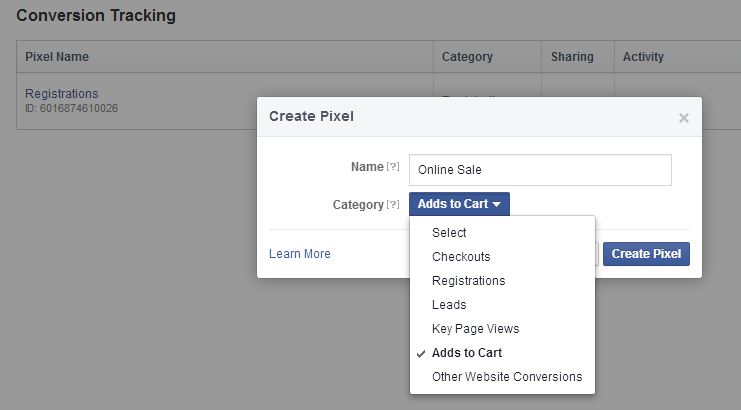 The first option that shows on the page is the “Limit Entry by Email” feature. In this checkbox feature, you are able to limit Sweepstakes entries per email address. Once you ticked the check box, the “Limit” drop-down menu and the “Limit Reached text” shows up in the screen. The “Limit” drop-down menu has 2 choices; 1 entry per email address and 1 entry per 24 hours. On the other hand, the “Limit Reached text” is the text that will display if the person entering has already entered or must wait to enter again. The next checkbox is “Entrant must agree to Terms” which enables a checkbox on the form that users must check to submit in order to enter the sweepstakes. Text for this checkbox can be modified below. The last checkbox underneath is “Add newsletter checkbox” which enables a checkbox on the form that allows users to subscribe to your newsletter. Text for this checkbox can be modified below. The Thank You Message Settings let you modify your thank you message in your response page. 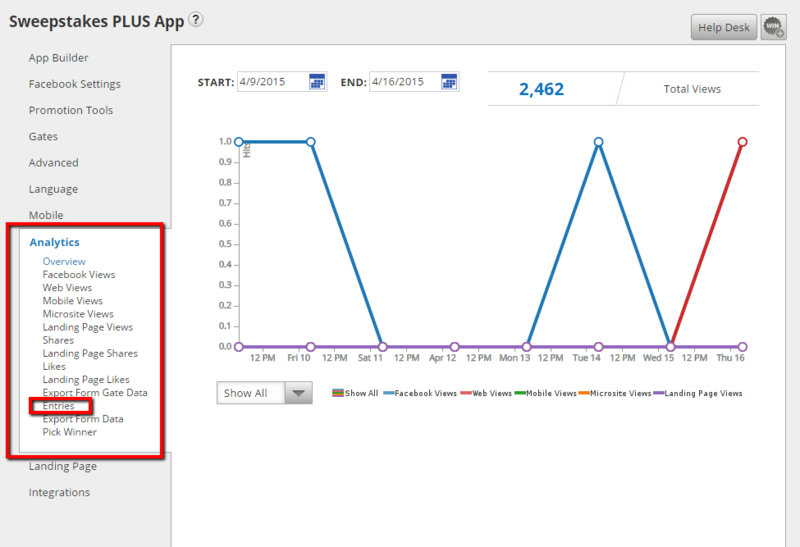 The feature lets you explain the actions of what entrants catch sight of after participating in the sweepstakes. Choose the boxes you would like to appear in your response page. The selections include a text area, image and form. You can customize your message in the text area as well as include an image if you like. 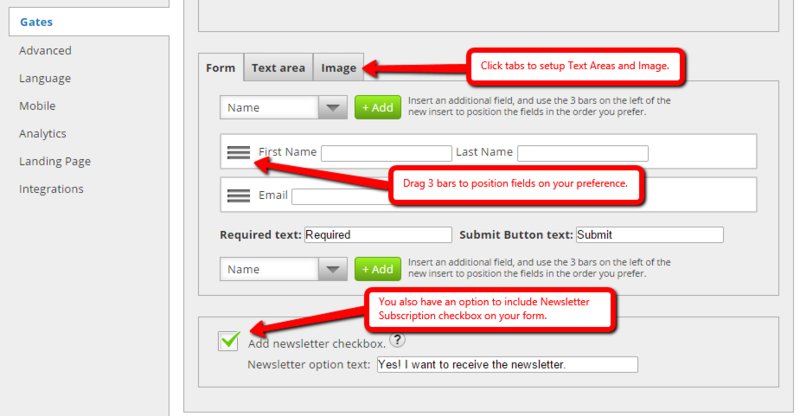 Outline the behavior of what participants see after you submit the optional form on the Optional Form Response section. If a URL is used for the Thank You Message, or No Thank You Message form is defined, the settings on this page will be disabled and have no effect. If you have selected the Response URL in the Thank You Message section, the user will go directly to the page URL after entering the sweepstakes. The statement that is always at the top of terms is "This promotion is in no way sponsored, endorsed associated with, or administered by Facebook or the App Developer of this Sweepstakes. 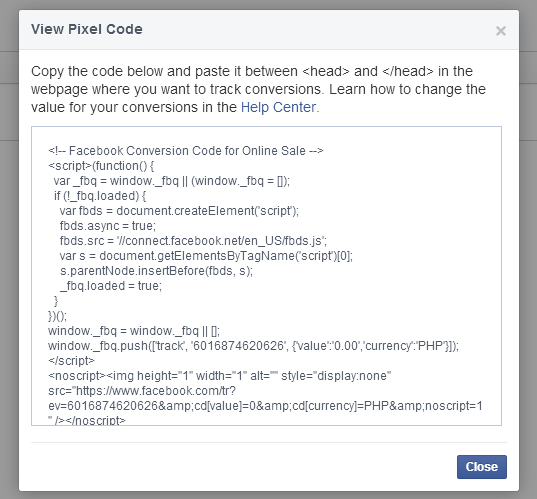 Your entry affirms you understand you are giving a complete release to Facebook and the Developers of this App and that you are not providing your information to Facebook or the App Developer." This is translated in multiple languages based on browser language detected. The Pre-Sweepstakes setup portal is where you setup what appears before Sweepstakes goes live. Before the start date of your sweepstakes, this information will be shown. You will be able to modify your message in the text area, upload an image associated to it and set its page alignment as well as update the labels you would like to use for your countdown settings and modify its label color. The Post-sweepstakes section is displayed after the end date of your sweepstakes. Modify your Text area by entering yo9ur desired post-sweepstakes message and an Image to inform its end date. Simply follow the rest of the steps stated in the Pre-sweepstakes section. Share your app to Facebook with the use of Facebook Settings. First of all, link your app to your preferred fan page. Then, indicate your selected tab name, a 111 x 74 pixel image for your tab logo and your tab icon. Tick the button called "Create your own application" to execute the task it says. After doing so, you will be required to enter your App ID and App Secret on their respective fields. The Mobile setting is consist of two Global Options; the "Render desktop version on mobile" and the second one is "Use like gate on mobile device". The first option enables mobile device users to use the app in their mobile phones, tablets or PCs or you can choose the second option which lets you use a Like Gate image feature to show your related information. 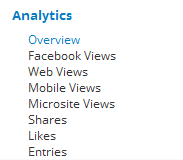 If you want to know the amount of traffic entering your site and where it is coming from, just check the Analytics section. It is composed of various graphs to be precise Overview, Facebook Views, Web Views, Mobile Views, Microsite Views, Shares, Likes and Entries. 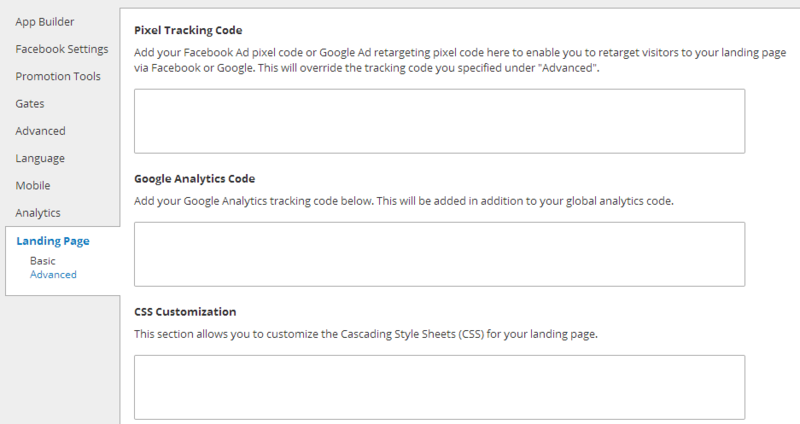 First, you use the TabSite widgets and tools to create your page layout, background, header, footer, etc. Container Properties tab - This is where you set background color for your sweepstakes widget, as well as text and link colors. Note if you have an overall tab background set, the widget will inherit that by default. You can override by using this feature in the widget. Always use the "Layers" area to edit the widget.